Are you looking for a quick & easy, last minute, Thanksgiving project? 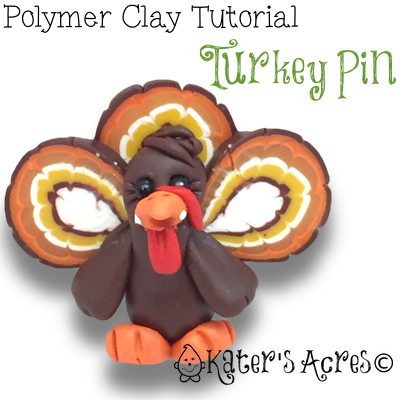 These cute little polymer clay turkey pins can be used on anything: outfits, napkins, given as gifts, or adapted as ornaments. Enjoy! NOTE: The tutorial for these feathers can be found here. Position the caned “feathers” as shown at right. Roll a ball of brown clay the size of a hazelnut into a long teardrop. Roll a smaller pea sized ball of clay into a circle. Press both shapes onto the feathers. Roll another two pea sized balls of brown clay as wings and press alongside the body, just under the head as shown at right. Roll a pea sized amount of orange clay into two teardrops. Attach them to the bottom of the turkey. Now add facial features including a gobbler, beak, & eyes. Turn the turkey over and place the pin back on the feathers. Use a small amount of brown clay and cover the base of the pin being sure that the edges are fully adhered to the wings. Now BAKE in your polymer clay dedicated over for 45 minutes at the recommended temperature for your brand of clay.